Smart and sustainable investment is required to boost jobs and growth, both in Europe and globally. Since November 2014, the Commission has mobilised significant EU financial resources in an innovative way that maximises the impact of public funds and mobilises private investment. Sustainable investment, in particular in infrastructure and small and medium-sized companies, has been at the centre of its political action, notably through a more efficient use of the limited resources of the EU budget, accompanied by measures improving the general business environment. The Commission continues to promote new ways to make the most of each euro of public resources, to mobilise the private sector and deliver tangible results in the real economy. In the EU, this approach is already showing encouraging results. The European Fund for Strategic Investments (EFSI), core of the Investment Plan for Europe, should therefore be reinforced and extended, both in time and as regards its financial capacity. Outside the EU, this new approach will also be useful to address the multiple challenges both in the EU Neighbourhood and in Africa. Against this background, and with a view to promoting sustainable development, jobs and growth in partner countries and addressing root causes of migration, the Commission is today putting forward an ambitious European External Investment Plan (EIP). The Investment Plan for Europe has proven to be a useful tool for delivering concrete results and encouraging a sustainable increase in the low investment levels in Europe after the financial crisis. The way the guarantee is constructed ensures an optimal use and leverage of scarce public resources to deliver tangible results for jobs and growth. The European Investment Bank (EIB) Group – the Commission’s strategic partner for the Investment Plan for Europe – has via the EFSI mobilised close to EUR 116 billion across 26 Member States in less than a year. During the same period, more than 200,000 SMEs have already benefitted from the EFSI 1 . From Finland to Greece, from Ireland to Croatia, from cutting-edge industrial projects to the renovation of the agro-food industry by SMEs and mid-caps in Europe, from wind-farms to the deployment of new health technologies, the EFSI is making a real difference by supporting innovative projects that contribute to job creation and growth in local communities. In this way, the EFSI is also instrumental in tackling youth unemployment 2 . On 28 June 2016, the European Council concluded that “[t]he Investment Plan for Europe, in particular the EFSI, has already delivered concrete results and is a major step to help mobilise private investment while making smart use of scarce budgetary resources. The Commission intends to soon put forward proposals on the future of the EFSI, which should be examined as a matter of urgency by the European Parliament and the Council” 3 . With its proposal adopted today, the Commission has delivered on these priorities. The Commission is committed to the doubling of the EFSI, both in terms of duration and financial capacity. The EFSI was established for an initial period of three years and with the aim of mobilising at least EUR 315 billion of strategic investments. Given its success, the Commission has decided to present an amending regulation, extending the EFSI over time and increasing its fire power. This will also avoid any possible disruptions as regards financing and assure promoters that they can still prepare projects to be submitted after the initial investment period. The legal extension presented today covers the period of the current Multiannual Financial Framework and should trigger a total of at least half a trillion euro investments by 2020. To enhance the firepower of the EFSI even further and reach the aim of doubling the investment target, the Commission calls on Member States to also contribute as a matter of priority. For the period after 2020, the Commission intends to put forward the necessary proposals to ensure that strategic investment will continue at a sustainable level. In addition to the extension over time and increased firepower, today’s legislative proposal reinforces the additionality, focussing on market failures and sub-optimal investment situations to ensure a higher level of crowding-in of the private sector. To maximise the impact of the initiative, the EFSI should continue to concentrate primarily on the quality of the investment projects (those leading to higher productivity and competitiveness), in addition to increasing investment volumes. In view of their importance for the Single Market, cross-border infrastructure projects, including related services, have been specifically identified as providing additionality. Moreover, the EFSI will in the future focus even more on sustainable investments across sectors to further meet Paris Agreement on Climate Change (COP21) targets and help delivering on the transition to a resource efficient, circular and zero carbon economy 4 in line with Agenda 2030 and the Sustainable Development Goals. It is also proposed to gear a larger part of financing towards SMEs given that the market absorption has been particularly quick under the SME window where the EFSI is delivering well beyond expectations. Finally, a set of new financial instruments, pooling resources from the programme for Employment and Social Innovation (EaSI) and EFSI, have been designed to strengthen support towards social entrepreneurship and microfinance 5 . An important objective of the EFSI 2.0 is to enhance the geographical coverage of the EFSI and reinforce the take-up in less developed and transition regions. In this respect, the combination of the EFSI with other sources of Union funding, including European Structural and Investment Funds (ESIF) is a key element 6 . Today, the Commission adopted a proposal for a simplification of the Common Provisions Regulation to facilitate such combination. In addition, the European Investment Advisory Hub will be enhanced at a regional and local level so as to actively contribute to the sectorial and geographical diversification of the EFSI. It is also proposed to enhance transparency in the investment decisions and governance procedures. The Investment Committee will have to further explain in its decisions, which are made public, the reasons why it deems that a particular operation should benefit from the EU guarantee, in particular as regards additionality. In addition, the scoreboard of indicators will be published once an operation under the EU guarantee is signed. Moreover, the proposal also includes an obligation for the EIB and the European Investment Fund (EIF) to inform the final beneficiaries, including SMEs, of the existence of EFSI support. Technical assistance will be delivered by the European Investment Advisory Hub closer to the ground via agreements with relevant local players. More targeted and tailor-made technical assistance will also be available for projects involving several Member States, for projects that contribute to reaching the objectives of COP21 and for the combination of the EFSI with other sources of Union funding, such as the European Structural and Investment Funds, Horizon 2020, the Connecting Europe Facility. The EFSI 2.0 proposal also provides in this context that the Hub should actively contribute to the objective of sectorial and geographical diversification of the EFSI, by supporting the EIB in its efforts to originate new projects on the ground, where needed. In this context, the Commission will explore the possibility to identify dedicated European investment envoys in its Representation offices in the Member States, who would work with the relevant Commission services in a single investment policy team. The general business environment is an important element when it comes to promoting sustainable investments. Some of the efforts to improve it must be carried out at national level; other challenges can usefully be tackled at the European level. As part of its efforts to improve Europe’s investment environment, the Commission has already tabled concrete initiatives to help support investment and facilitate the financing of the real economy, such as the lowering of capital charges for insurance and reinsurance companies as regards infrastructure investments and the adoption of practical guidance on the application of State aid rules in the context of public funding of infrastructure. In addition, the Energy Union, the Capital Markets Union, the Single Market and the Digital Single Market Strategies, as well as the Circular Economy package and international trade and investment agreements all contain specific measures that will remove barriers, promote innovation and further improve the environment for investment, when fully implemented. For instance, the Energy Union will contribute to increasing ex-ante certainty on public accounting for specific sectors, such as energy efficiency. Eurostat has further developed and clarified the relevant public accounting rules (ESA 2010), particularly in the domain of public-private partnerships (PPPs). A guide to the statistical treatment of PPPs, produced in cooperation with the EIB and mainly addressed to private stakeholders, will be released on 29 September 2016. This publication will be followed by an active outreach campaign. In addition, and as highlighted in the 1 June Communication, Eurostat is closely monitoring the impact of public accounting rules on the creation of PPPs in different sectors and will take further action where appropriate. The Capital Markets Union 7 will help remove financial barriers to investment. To this end, further amendments to Solvency II are being considered in relation to insurers’ investments in infrastructure corporates and to the venture capital regulatory framework. The Commission will also, as part of the forthcoming revision of the banking legislation that will be adopted before the end of the year, propose lowering the capital charges that apply to banks when they invest in infrastructure assets. Initiatives to further reinforce the Single Market in goods and services are also vital to unlocking the full potential of investment in Europe. The Single Market Strategy will help create new business opportunities and remove existing regulatory and administrative barriers, notably for service providers seeking to expand across Europe. Work is ongoing on concrete proposals linked to the enforcement of single market rules as well as measures in the area of business services, business restructuring and insolvency and the creation of a simple, modern and fraud-proof VAT system. The Digital Single Market Strategy will enhance regulatory certainty in the digital sector. The Commission is exploring the design of a single EU authorisation framework that would directly apply to large projects with a cross-border dimension or major Investment Platforms that involve national co-financing. Member States should step up their efforts to implement the necessary reforms aimed at removing obstacles to investment which were identified in the context of the European Semester. This concerns areas like insolvency, public procurement, judicial systems and the efficiency of public administration or sector-specific regulations. These reforms identified in the country-specific recommendations are a necessary condition to sustain and increase investment levels in Member States, taking into account national specificities. The recommendations for reforms in the area of investment will be discussed in the various Council formations in the autumn. Against this background, and by way of preparation of the 2017 European Semester, the Commission will also update the assessments on the challenges to Member States’ investment environments which will be published again alongside the Annual Growth Survey. Investment is also a key factor in transforming development policy and assistance in order to better support the achievement of the Sustainable Development Goals, and address the multiple challenges faced in both the EU Neighbourhood and Africa. Smart and sustainable investment can play an essential role in boosting jobs and growth in developing countries, bringing in more stability and improving conditions on the ground in fragile countries affected by conflict. On 28 June 2016, the European Council endorsed the Commission’s proposal for a new Partnership Framework with third countries 8 . This Framework is based on the premise that tackling the migration challenge requires a joint effort fully embedded into the EU’s overall relationship with partner countries and supported by all relevant EU policies and tools. In order to address migration flows, compacts with partner countries are being developed to achieve the short-term objectives of saving lives at sea, increasing the rate of returns and enabling migrants and refugees to stay close to home. A new approach is needed to address the factors that constitute the root causes of migration, and to support partners to manage its consequences, both in Africa and in the EU Neighbourhood, by financing investments and addressing barriers to private investment. In 2015, more than 60 million people left their places of origin in search of a better life, either because they were seeking refuge from conflicts and wars or because economic opportunities at home were limited. North African and Middle Eastern countries hosted about 40% of all displaced people worldwide, Sub-Saharan Africa accounted for another 30%. The combination of high numbers of displaced people and weak economic prospects is a shared challenge for the Union and its partner countries. The Union’s external policies, and in particular its development and Neighbourhood policies, seek to promote the Union’s values and interests, including through the promotion of prosperity. Economic growth is a prerequisite for sustainable development, but economic growth in developing countries has now reached its lowest level since 2003. Instability and conflicts in Africa and the EU Neighbourhood have been aggravated by the global economic crisis, resulting in increased overall indebtedness. Companies face credit crunches, reducing access to finance for badly needed investment. Unsustainable use of natural resources often deprives developing countries of potential sources of economic growth. As regards foreign direct investment (FDI) going to developing countries, only 6% goes to fragile countries 9 , pushing down the investment per capita to a level almost five times lower than in other developing countries. Similarly, the cost to start a business is almost three times higher in fragile countries than in non-fragile countries. Growth in Africa has slowed to the weakest levels in years, notwithstanding continued demographic growth. Combined with significant security issues, this trend exacerbates poverty, holds back sustainable development, and results in economic and social conditions that are often among the root causes of migration. A stronger focus on investment is a key element also of the UN’s 2030 Agenda, its Sustainable Development Goals (SDGs) 10 , and the Addis Agenda on Financing for Development. While official development assistance remains essential for the poorest and fragile countries in their efforts to fight poverty and achieve sustainable development, other means of financing of our partner countries gain much additional weight including investment, trade, domestic resource mobilisation and good governance. On the economic front, a new approach attracting in particular private sector investment is needed, in order to generate investment on a scale necessary to address economic, social, and environmental challenges. Commitments taken in Addis Ababa by the international community 11 , including the Union and its Member States, aim to foster inclusive economic prosperity to improve people’s wellbeing, while protecting the environment. As part of this process 12 , promoting affordable and stable access to finance is essential. This new targeted approach will help support sustainable development in partner countries, which in turn will become the growth markets of the future. It will also provide opportunities for private enterprises through trade and investment, including from Europe, thus also supporting European Economic Diplomacy and contributing to European economic growth. It will support the implementation of the new Partnership Framework proposed to the partner countries by the EU. In order to achieve these goals, which are fully in line with the EU Global Strategy on Foreign and Security Policy 13 and the revised European Neighbourhood Policy 14 , the Commission is putting forward for the first time an ambitious Plan, initially for Africa and the EU Neighbourhood. This will also be an important contribution that the EU will present to its partners at the upcoming UN General Assembly in New York, where global responsibility sharing for addressing the long-term trends in the field of migration will be at the centre of the discussion. 8.Draft Commission Decision on the individual measure for a contribution to the EFSD Guarantee Fund to be financed from the 11th European Development Fund. The EIP ensures a coherent European approach to investments outside the EU, by combining existing instruments with three important innovative elements. First, it combines into one coherent Plan various actions that promote an improved business and broader policy environment in partner countries as regards access to finance and the development of economically viable projects. Second, it creates a single entry point for financing requests for investments, thus ensuring efficiency and leverage of public financial institutions and the private sector. Third, it addresses, through a new guarantee mechanism, specific needs for private investment in environments with higher risks. The EIP is a new approach to the way the Union supports sustainable development and identifies, prepares, and delivers support for investment projects in countries outside Europe. The Plan offers an integrated framework for a partnership enabling full cooperation between the EU, Member States, International Financial Institutions, other donors, public authorities and the private sector. It will improve the way in which scarce public funds are used and the way public authorities and private investors cooperate on investment projects. 15 It will also support the reforms needed to fight corruption, improve economic governance and local business environments, in full cooperation with the partner countries concerned. The Plan aims to boost investment and job creation in Africa and the EU Neighbourhood, crowding-in financing, in particular from the private sector. It builds on the experience gained with the EFSI and benefits from the expertise of the Commission, the EIB, and other institutions with investment facilities for developing countries. The Plan will work alongside and complement existing international cooperation and development instruments. In particular, it will complement the projects undertaken with partner countries under the EU Emergency Trust Fund for Africa 16 and the EU Regional Trust Fund in Response to the Syrian Crisis 17 to achieve short-term objectives of the Partnership Framework. It will do so by strengthening longer-term development strategies which provide real economic opportunities for local people and reintegrated migrants, thereby addressing root causes of migration. In this way, the Plan will constitute a crucial tool for the achievement of the SDGs, and to leverage additional resources for development in line with the Addis Agenda for Action on Financing for Development. In the EU Neighbourhood, it will promote economic development to progressively achieve stabilisation and transition from emergency to structural responses. The possibility to gear investments under the Plan towards sustainable and renewable energy will also contribute towards implementing the COP 21. (iii) supporting economic and structural reforms to improve the business and broader policy environment. These priorities are inspired by the key principles of, and experience gained with, the Investment Plan for Europe. Structural and institutional reforms and improvement of the overall business environment are essential to underpin long-term, sustainable growth. Without this, the impact of investments might be short-lived. Effectively scaling up investment in partner countries requires specific analysis and tailor-made responses. This is particularly true in partner countries affected by fragility, conflict, significant outward migration and weak public sector institutions. Specific “investment windows” under the Plan will be established for this purpose. The Commission proposes to open up investment opportunities in partner countries by leveraging existing EU resources in a manner similar to the Investment Plan for Europe and the EFSI. At the centre of the EIP lies the creation of a new European Fund for Sustainable Development 18 . 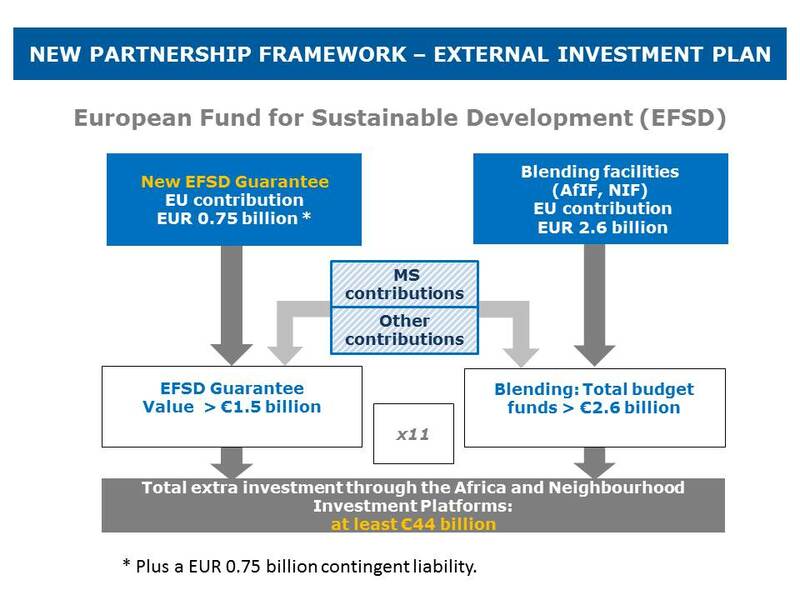 The EFSD will be composed of regional investment platforms, which will combine financing from existing blending facilities 19 and the EFSD Guarantee from resources stemming from the EU budget and the 11th European Development Fund 20 . The governance structure of the EFSD will ensure close coordination with actions undertaken under the proposed extended External Lending Mandate of the EIB, including its new Resilience Initiative and the ACP Investment Facility. The EFSD is expected to trigger additional public and private investment volumes, mobilising total investments of up to EUR 44 billion, based on EUR 3.35 billion contribution from the EU budget and the European Development Fund. In order to enhance further the firepower and the efficiency of the new Fund, the Commission calls on the Member States and other partners to match these EU contributions. If they match the EU guarantee, with the flexibilities described below, the total amount of additional investment could be EUR 62 billion. If they also match the contribution to the blending, this amount could reach EUR 88 billion. 1.1 How will it work? Combining the existing and well-established blending facilities with a new, additional guarantee and putting them under one coherent framework, will create a “one-stop shop” for public and private investors. This will allow partners to find swiftly the most appropriate products and ensure that projects become realities that create jobs and contribute to sustainable development. The two first Regional Investment Platforms will cover Africa and the EU Neighbourhood (South and East), with the possibility of expanding the coverage to other regions at a later stage. The new Platforms will combine the existing Blending Facilities (the Africa Investment Facility and the Neighbourhood Investment Facility), with refocused objectives and new tasks. The EFSD guarantee will help to enhance credit and increase the leverage factor, which will benefit the final beneficiaries and projects. The new approach will allow for investment-oriented risk sharing with other investors, and in particular private actors. It will enable crowding-in private investment by addressing the key factors that currently prevent it. The specific projects will be agreed jointly by all interested parties in a swift process. While the countries in Africa and the EU Neighbourhood often share common challenges, there is a need to take specific regional or sectorial conditions into account. Strong involvement and ownership of the partner countries throughout the design and implementation of the projects will thus be critical. Financial institutions already active in the relevant regions will be invited to bring their own proposals to benefit from the new guarantee. The EIB, in addition to being one of the key implementing financial institutions, will provide an advisory role to further strengthen the quality and impact of the investment strategy. Socio-economic sectors and in particular infrastructure, including energy, water, transport, information and communications technology, environment and social infrastructure will be targeted, as well as investments in human capital and access to finance for micro-, small- and medium-sized enterprises, with a particular focus on job creation, including for young people and women. The EU’s strategic partner for investments, the EIB, will support this EU initiative, by financing investments eligible under the EFSD and catalysing other sources of finance, in particular from the private sector. Like the EFSI and several financial instruments supported by the EU blending facilities since 2007, the new EFSD guarantee will mobilise additional investments, in particular from private investors. Investments will target specific regions, countries or sectors through the establishment of “investment windows” by the Commission. The guarantee will be granted to eligible counterparts (financial institutions or private sector investors) by means of guarantee agreements implementing the investment windows. These counterparts will in turn provide support (via loans, guarantees, equity or similar products) to selected portfolios of investment projects and make sure that the guarantee coverage is passed-on to the final beneficiaries. Based on conservative estimates, the Commission expects that every euro guaranteed will mobilise a total of more than ten euros of investment. 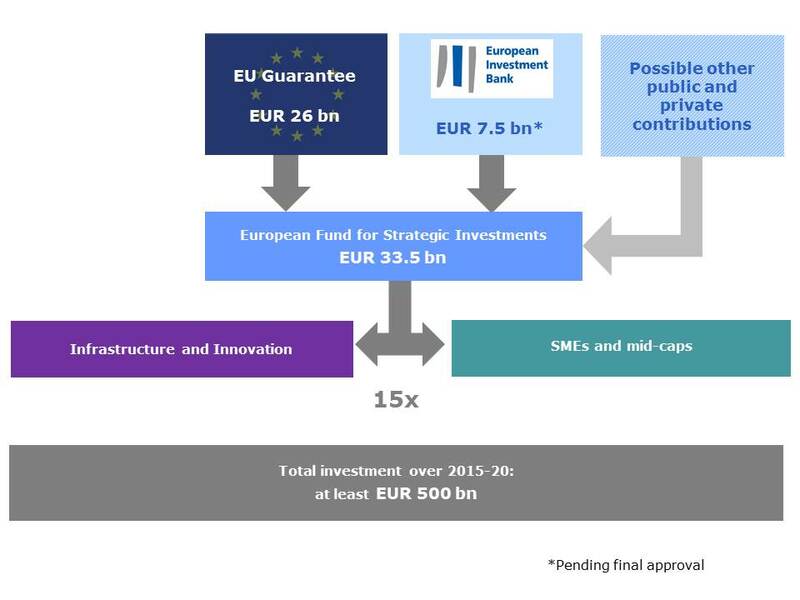 The Commission proposes an innovative scheme whereby the EUR 1.5 billion of guarantee covered by the EU budget would be backed by a guarantee fund provisioned with EUR 750 million 21 , to maximise the impact of the new EFSD guarantee and reach a critical mass able to deliver results in line with the needs identified. The impact of the new EFSD guarantee will be greatly enhanced if Member States decided an additional contribution of at least EUR 750 million provided in the form of a second loss guarantee that would only be called in the unlikely scenario of losses above EUR 1.5 billion. Contributing Member States would not bear any contingent liability above the amount of their guarantee. Member States will be able to contribute also in cash. Importantly, in the context of the assessment of public finances under the Stability and Growth Pact, the Commission will take a favourable position towards Member States’ contributions to the Fund, as has been the approach in the context of the EFSI. 22 In the case of cash contributions by Member States, these should in principle qualify as one-off measures; a Member State guarantee would not, in principle, impact the public deficit unless called 23 . In addition, Member States contributing to the enhancement of the EFSD guarantee would be allowed to earmark their contribution for a specific purpose. This can be done by region or sector. This will help align the objective of maximising the impact of the External Investment Plan with the priorities of Member States. The Commission will be advised by a Strategic Board and two Operational Boards, one for each Regional Investment Platform. The Commission will manage the EFSD Secretariat, which will ensure the performance of all tasks and functions needed to fulfil the objectives of the EIP. The Strategic Board, co-chaired by representatives of the Commission and of the High Representative of the Union for Foreign Affairs and Security Policy and composed of the Member States and the EIB, will give strategic guidance and help the Commission set overall investment goals as regards the use of the EFSD Guarantee, ensuring coordination and coherence between the Regional Investment Platforms and with the External Lending Mandate, the Resilience Initiative and the ACP Investment Facility managed by the EIB. The EIB will actively contribute through advisory functions to the Commission as regards the operational management of the guarantee. A sound technical assessment and due diligence as well as a swift implementation of individual projects will be ensured. The bankability and risk of the projects will be assessed by the eligible counterparts and verified by independent experts to ensure the credibility vis-à-vis the private sector, before the investment proposals are approved by the Commission. The detailed practical modalities of how to implement the guarantee will be decided for each investment window. Mobilising more investments requires the development of financially-sound, attractive and mature projects. In the context of the EIP, the Commission has made significant resources available for technical assistance to help partner countries attract investment by developing a higher number of bankable projects and making them known to the international investor community. The Commission will draw on the EU’s own experience obtained under the Investment Plan for Europe, in particular as regards developing the European Investment Advisory Hub and the European Investment Project Portal. Technical assistance will focus on better preparing and promoting projects so that they attract more investment, through financial envelopes for technical assistance designed within the EFSD Regional Investment Platforms. Existing technical assistance in partner countries for private sector development through dedicated thematic, national, and regional EU programmes will be refocused to ensure that it contributes to the overall objectives of the EIP, and in particular that it attracts sustainable investment. The visibility and accessibility of EU financing opportunities and technical support would be provided via a project web-portal. In addition, the Commission will pursue a structured dialogue in order to understand the needs and constraints of the local private sector and to boost the potential of the European private sector to invest in and engage with businesses in partner countries. Moreover, the Commission will also, in coordination with the Member States, facilitate and support inclusive public-private policy dialogues in partner countries to identify key challenges and opportunities. The Commission will also provide targeted capacity building for private sector representatives, including chambers of commerce, social partners, and organisations representing micro-, small- and medium-sized enterprises and female entrepreneurs. The Plan also aims to improve the business environment in partner countries. It will do so by reinforcing the economic and social policy dialogue between the EU and partner countries in order to develop more effective legal frameworks, policies and institutions that promote economic stability, sustainable investment and inclusive growth. Training through practical policy-oriented courses, hands-on workshops, twinning projects, and seminars, will strengthen officials’ capacity to analyse economic developments, formulate, and implement effective policies. Political and policy dialogues with partner countries will be strengthened, in order to support sustainable and inclusive growth, respect of human rights, fight against corruption and organised crime, illicit financial flows, and improve trade relations of the EU’s partners. Such dialogues, conducted in close coordination with partner institutions active in the countries, will contribute to better regulation and development of markets in partner countries, improving employment opportunities and supporting the development of the local private sector. An improved business environment and investment climate in partner countries will benefit both the local private sector and EU companies wishing to invest. More jobs will be created and the economic links between partner countries and the EU will be strengthened for mutual benefit. The EIP therefore complements the Investment Plan for Europe. As part of its commitment to sustainable development, the EU will make full use of existing initiatives under its energy and climate diplomacy agendas. Direct interaction with companies and sectorial associations will also be sought to encourage more private sector engagement and market-based solutions in sustainable agriculture and agribusiness, sustainable energy, infrastructure and social sectors. The Commission calls on the co-legislators to deal with the proposals as a matter of priority, adopted today in line with the requests of the June European Council. The European Parliament and the Council are invited to reinforce and extend the EFSI and to kick-start the launch of the External Investment Plan through the establishment of the EFSD which should be operational as soon as possible, and by the latest by the EU-Africa Summit, currently foreseen for autumn 2017. The Commission will support the European Parliament and the Council during the negotiations and will continue its dialogue with all relevant stakeholders. The Commission will also draw on the experience with the implementation of these instruments in view of the upcoming discussions on the new Multiannual Financial Framework. (1) See Commission Communication of 1 June 2016, ‘Europe investing again – Taking stock of the Investment Plan for Europe and next steps’, COM(2016) 359 final. (2) The EFSI Regulation foresees three evaluations: the Commission evaluation is published alongside the EFSI 2.0 proposal and the EIB evaluation is currently scheduled for October. The independent evaluation, to be carried out by external experts, will be available in November. (4) As regards transport and energy projects, the Commission proposes to focus the EFSI even more on the EU political priorities as defined in Connecting Europe Facility (CEF) and trans-European transport network TEN-T guidelines. Moreover, the Commission recognises the importance of using part of the EU budget, such as the one available under the CEF, in the form of grants for blending with the EFSI. The combined use of grants and the EFSI will help projects become economically and financially viable, thus enhancing the value added of Union spending by attracting additional resources from private investors. (5) As a result of this, the total amount of financial instruments in support of social enterprises and microfinance is expected to exceed EUR 1 billion, as opposed to EUR 193 million initially earmarked under the EaSI third axis, and is expected to mobilise almost EUR 3 billion of overall financing, including from the private sector, at the final recipient level. (6) The Commission has already published concrete guidance on this matter ( http://ec.europa.eu/regional_policy/sources/thefunds/fin_inst/pdf/efsi_esif_compl_en.pdf ) and will continue to further simplify the overall framework to develop such combinations. (7) See the Communication adopted today, ‘Capital Market Unions – Accelerating Reform’, COM(2016) 601. (9) In 2012, this figure amounted to USD 38.7 billion according to the OECD (2015) ‘States of Fragility’ report. (11) Addis Ababa Action Agenda on Financing for Development. (12) The process involves domestic resource mobilisation, official development assistance, and the mobilisation of investment within regulatory frameworks that set the right incentives. (14) Joint Communication ‘Review of the European Neighbourhood Policy’ of 18 November 2015, JOIN(2015) 50 final. (15) As a further means of contributing to the coordinated European approach to migration called for in the 7 June Communication and as a complement to the External Investment Plan, the Commission will examine the possibility of the EU becoming a shareholder of the Council of Europe Development Bank. (16) C(2015) 7293 final of 20 October 2015. (17) C(2014) 9615 final of 10 December 2014. (18) Commission proposal for a Regulation of the European Parliament and of the Council on the European Fund for Sustainable Development (EFSD) and establishing the EFSD Guarantee and the EFSD Guarantee Fund, COM(2016) 586. (19) For Africa, see Commission Decision (2015)5210 and for the Neighbourhood, Commission Implementing Decision (2016)3436. (20) Internal Agreement between the Representatives of the Governments of the Member States of the European Union, meeting within the Council, on the financing of European Union aid under the multiannual financial framework for the period 2014 to 2020, in accordance with the ACP-EU Partnership Agreement and on the allocation of financial assistance for the Overseas Countries and Territories to which Part Four of the Treaty on the Functioning of the European Union applies (OJ L 210, 6.8.2013, p. 1). (21) Stemming both from the Union’s budget and the 11th European Development Fund. In addition, there will be a contingent liability of EUR 0.75 billion. (22) See the Commission Communication ‘Making the best use of the flexibility within the existing rules of the Stability and Growth Pact’ of 13 January 2015, COM (2015) 12. (23) Cash contributions should in principle qualify as one-off measures which have no bearing on the underlying fiscal position in the assessment of the necessary fiscal adjustment under the Stability and Growth Pact. A national guarantee would, in principle, not impact the public deficit, as it requires no upfront cash disbursement, nor impact the public debt ratio, unless the guarantee is called. In practice, the assessment of how a given guarantee would affect Member State’s deficit or debt is to be done by the competent statistical body.